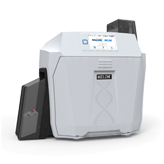 Support solutions for single or double sided models for Magicard Helix retransfer card printers. The PDF document below has instructions on how to install and use a Magicard printer over Ethernet.on a MAC OS 10.5 and above. Please download this guide for information and tip to creating a good custom HoloKote for your Magicard printers.